CoheaHr is an European research consortium funded by the 7th framework program of the European Union (Health-F3-2013-603019). 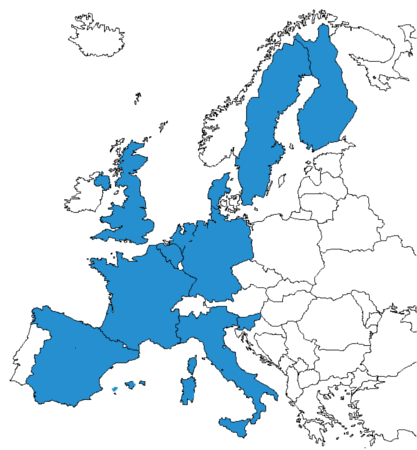 Europe’s leading research institutes on HPV-related diseases are part of the consortium, including in total 12 partners from 11 different European countries. The consortium represents specialists from a wide array of disciplines including epidemiologists, virologists, gynaecologists, pathologists, health economists, molecular biologists, viral transmission modellers and statisticians. CoheaHr was divided into five research topics, which included four new implementation studies in the first three research topics. The fourth research topic involved mathematically modelling of both existing data as well as the newly collected data in the CoheaHr studies. The fifth research topic involved building a data-ware house and conducting pooled analyses. Offering self-sampling for hrHPV testing is a feasible and effective mean for detecting CIN2+ in screening non-attendees but the clinical accuracy of hrHPV self-sampling versus clinician sampling had never been studied in a proper randomized manner. A pooled comparative analysis using data imported in the national cervical screening registry in Sweden. Moreover, proficiency panels specially designed to evaluate the performance of HPV screening were distributed for comparison of HPV testing laboratory performances. Cancer risk will be significantly reduced in vaccinated women. If screening programmes are not changed for vaccinated women - the number of unnecessary referrals will likely increase, leading to unnecessary costs. Vaccination trials have documented that vaccine efficacy among adult women up to age 45/55 is excellent provided they are HPV negative at the time of vaccination. However, HPV vaccination coverage of adult women in Europe is low to very low. Update and extension of a previously stablished standardized data warehouse of European trials on HPV screening conducted in vaccinated and unvaccinated women as part of the PreHdict project (European funded project FP7-HEALTH-242061). Conduction of pooled analyses using such standardised datasets. Conduction of meta-analyses using such standardised datasets and other studies not included. Mathematical models can be used to describe the natural history of HPV infection and therefore predict the impact of different screening and vaccination strategies at a population level. As part of the activities conducted within this project, two dynamic transmission models were optimised and extended with the aim to assess different cervical cancer prevention strategies and their cost-effectiveness.